Ah, vacation: a chance to relax and get away from it all — but maybe not too far away. Having a cell phone abroad makes it easier to stay connected back home and provides convenient navigation and coordination in a foreign country. But setting up international cell phone service can be an expensive hassle. For most people in most places, buying a prepaid phone or SIM card for the country you’re visiting is the easiest and most cost-effective way to beat steep international roaming rates. Here are a few questions you can ask yourself to help you find the best solution for your next expedition. 1. Do I really need to bring my own phone with me? OK, let’s talk crazy upfront: People survived without cell phones for the entirety of human history until about 20 years ago. Can you get by for two weeks in Paris without one? Most likely, it’ll be easy to find free or cheap Wi-Fi for your laptop, enabling you to check on things back home and figure out how to navigate your locale. Plus, you won’t find yourself standing on the Champs-Élysées refreshing Instagram like a rube. Traveling phone-free requires some extra planning and inconvenience, but if you’re on a tight vacation budget, this is obviously the cheapest route. Enough crazy talk. Having a phone is undeniably convenient, but bringing your U.S. plan abroad usually isn’t. For most people in most places, the best solution is to just leave it at home and pick up a prepaid phone when you land. As of May 2016, you can hop over to U.K. mobile carrier O2’s website and buy a cheap Android smartphone for $22 (£15). For another $15 (£10), you can top it up with 500 megabytes of 4G data, 250 minutes and 1,000 texts. That should be more than enough for a two-week trip to the U.K., as long as you can resist streaming video over your phone. So, for $37, you won’t have to worry about any roaming overages or international package fees, plus you’ll get 4G data, something that’s hard to find abroad on a U.S. carrier. The phone might not be the most robust in terms of features or longevity, but that’s not the point. It’s cheap, it’s functional and it’s fairly easy. The only minor sticking point would be transferring over your contacts. We’d recommend this option for most travelers, unless you can unlock your phone as discussed below. Of course, each country will have different phones, prices and network options. But as you’ll see, international roaming from U.S. carriers can get expensive quickly; taking a few minutes to comparison shop the prepaid providers where you’re visiting is always worthwhile. 2. What if I want my phone, but don’t want to pay for roaming? Even easier than buying a prepaid phone when you land, you might be able to just buy a prepaid SIM card and pop it into your own phone. Using our previous example in this case, you’d only be paying $15 for an O2 SIM card with preloaded minutes, texts and data. Not everyone’s phone can do this immediately, though. Depending on how old your phone is and where you bought it, your phone could be anything from already unlocked to impossible to unlock. The best thing to do is call your carrier and ask it to unlock your phone. Legally, your carrier has to unlock it, as long as you’re off-contract and it’s actually possible for it to do so. If you’re still under contract and your carrier won’t unlock your phone, just pick up a prepaid phone, as previously mentioned. How to turn off data on an iPhone. Let’s say you really don’t want to pay for any kind of international service, but you’re going to have your phone on you anyway, for pictures and such. In that case, over-the-top messaging provides a free and somewhat handy solution for keeping in contact back home and with your fellow travelers, though it won’t provide on-the-spot voice, text or data service. Apps like iMessage, WhatsApp and Viber (among others) are messaging services that allow you to make calls or send texts anywhere in the world, without using text or minute allotments. How to turn off data on an Android phone. It’s not the most convenient option, as you’ll have to hunt down Wi-Fi when you want to get in touch. But this means you can keep your phone with you, not pay international rates and call or text anyone anywhere in the world for free. 3. What if I absolutely can’t live without my own phone and U.S. cell phone plan? 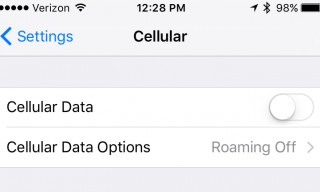 All four major U.S. carriers have international roaming options, with much better rates than in the past. However, it’s hard to find a plan with high-speed data that won’t cost you dearly. T-Mobile , for example, includes unlimited 2G data and texting in 140 countries with its Simple Choice plans. International roaming calls are 20 cents a minute. However, if you want anything faster than 2G data — which is only good for things like email and basic web browsing — you’ll have to pay $50 for 500MB of high-speed (usually 3G) data, good for two weeks. That’s $100 per gigabyte of data. In most of North and South America, Sprint gives you unlimited talk and text, plus 1GB of 3G data, all for free through its Open World add-on. In other commonly traveled countries, Sprint still gives you unlimited texting, but calls are 20 cents a minute and data is $30 per gigabyte. AT&T’s basic international package costs $30 and only gets you 120MB of data, which is a rate of $250 per gigabyte. Calls are $1 per minute, and texting is unlimited. You can pay more upfront for a package with better calling rates and more data. Verizon’s international roaming structure is different, as it charges $10 per day for you to use your phone and then allows you to use your plan’s minutes, texts and data as usual. This means potential access to 4G data speeds, depending on the country, but if you use your phone every day on a two-week trip, you’re looking at an extra $140 tacked onto your phone bill. If you’re really serious about using your own phone abroad often, Google’s experimental mobile service Project Fi is worth a look. You’re limited to a choice of three Android phones, but in most countries you get unlimited texting, calls for 20 cents or less per minute, and 3G data at a flat $10 per GB. If you’re OK with 2G speeds, T-Mobile’s plan is the way to go. But if you’re not already with T-Mobile, there’s no sense switching over for just one trip. Pick up a prepaid phone or SIM instead. Stephen Layton is a staff writer at NerdWallet, a personal finance website. Email: slayton@nerdwallet.com . The article Cell Phone Options When You’re Traveling Overseas originally appeared on NerdWallet .